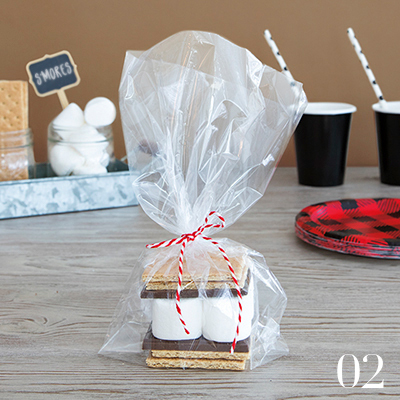 Gather ‘round the fire, get bundled up in flannel, and grab a bag of marshmallows! We’re ready for a lumberjack party! There’s no better way to warm up during the winter months than by channeling your inner outdoorsman. 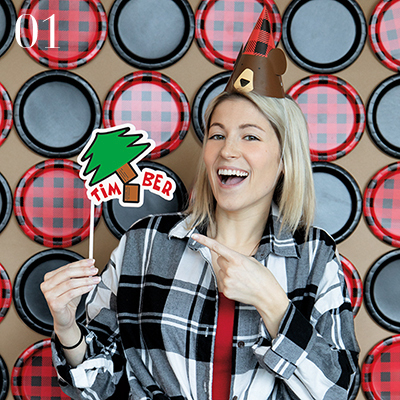 We decided to stay toasty this January by throwing our own lumberjack themed party – complete with rustic charm and tasty treats. 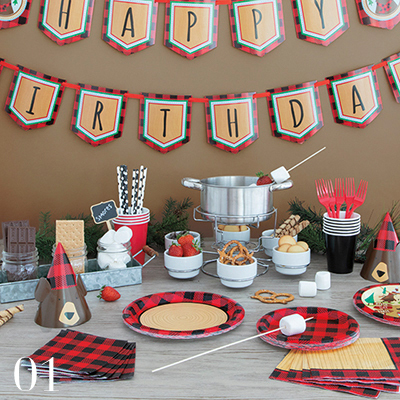 Get set for an expedition of your own by reading through our lumberjack party ideas! Ask any lumberjack what their favorite sandwich is, and we’ll bet they say “S’MORES!” Really, who doesn’t love a sweet snack made of marshmallows, graham crackers, and melted chocolate? We put together a delicious s’mores station, complete with chocolate fondue as a kid-friendly, indoor alternative to a traditional campfire. 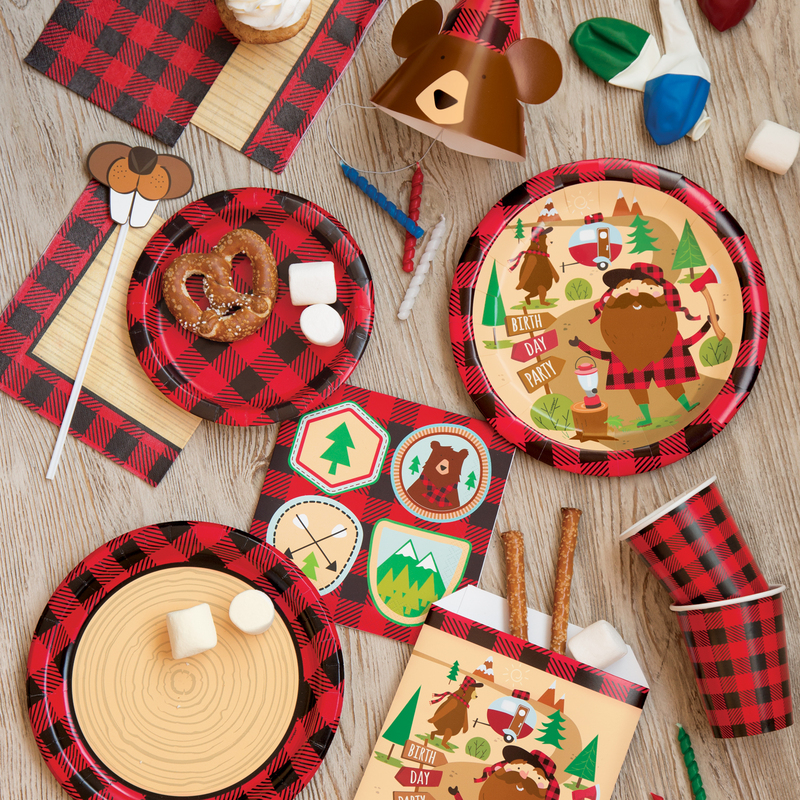 Decked out in big brown bears, buffalo plaid patterns, and burly beards to boot, our lumberjack party tableware helped turn our celebration into a wild, woodsy adventure. Our bamboo skewers were great for holding a mix of treats to dip in the chocolate – all marked with our handy chalkboard food signs. Some of our favorites included strawberries, pretzels, and wafers. And the s’mores fit just fine on our 7-inch plates when they were finished! 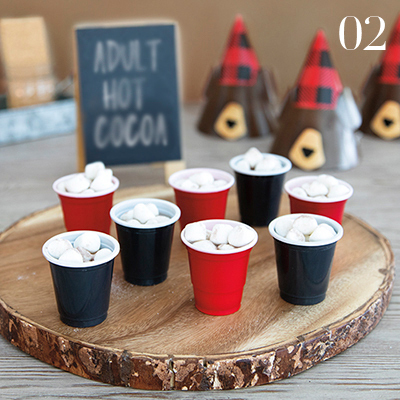 For the adults, we supplied hot chocolate drinks with a little extra “kick.” Using mini marshmallows as a garnish, these cozy drinks were fun to sip on – responsibly, of course! Break out your beard brush and clean the crumbs between your bristles… It’s picture time! We brought a backpack’s worth of Lumberjack Photo Booth Props to the party, so we could see some grizzly-haired grins from all of our guests. To create a backdrop for the pictures, we arranged a mix black and buffalo plaid paper plates on the wall in a checkerboard pattern. An optional idea for our fellow trailblazers: keep a log or a stump somewhere close for guests to prop a foot on! To thank everyone for coming, we put together cute little goodie bags with s’mores ingredients inside. All it took was a pack of cello bags and some twine, and these adorable lumberjack party favors were ready to go! You don’t have to chop down any trees to throw your own wilderness-inspired event. 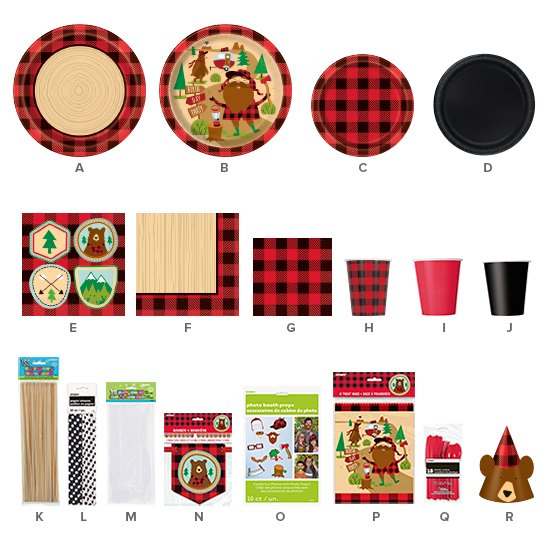 Simply shop our Buffalo Plaid Lumberjack party supplies online or take a hike to your local party store!